Last Christmas, my toddler was almost 2 and just beginning to really understand Christmas. I was so excited about Christmas Day that there were a few things that I didn’t think though properly. There were a few mistakes that I made that I urge you not to make with your toddler this Christmas Day. This is what happened to us last year and the result was a MAJOR toddler meltdown by about 2pm. An overtired, super excited, sugared up toddler is a great way to put a dampener on the Christmas Day festivities. This year it will be an early(ish) bedtime and we will be scheduling some quiet time during the day (a great opportunity to watch a Christmas DVD or look through our Christmas books). What? Is there such a thing? I actually found this really surprising last year, but my almost 2 year old had so many presents she actually got bored of opening them. Do you know why? She wanted to PLAY with the presents she opened, when she opened them. Imagine giving a toddler a great new toy and then telling them they couldn’t play with it straight away. We ended up opening presents over a few days. This year we have cut back on the amount and have chosen a few quality presents that we know she will really love. There’s no way you would let your toddler eat sugary, sweet food all day long on any other day, yet on Christmas day we tend to overlook this fact. Very quickly the reason we don’t let this happen becomes amazingly clear. Remember that after the sugar high comes the sugar crash! This year I will be ensuring that my toddler eats a big breakfast, lots of healthy snacks and a decent lunch and dinner. That way the treats will be just that – treats. No shops are open on Christmas Day where I live. NONE. So if you have bought a toy and forgotten to get batteries that fit, you will definitely not be very popular on Christmas morning. My advice is to buy enough for all the toys you need (check the sizes!) and then buy some more. I guarantee a friend or family member will also buy your toddler a battery operated toy so it’s always best to be prepared. If you have bought your toddler any major presents that need assembling (trike, play kitchen, dolls house etc) you have probably already considered that it needs to be assembled and have put aside an hour or two on Christmas Eve. Mistake number 1. Putting together some of these items can be like putting together IKEA furniture with no allen key. Add at least an hour to the time you’ve put aside, or even better, assemble them a few days before. Don’t forget about the smaller presents too. So many of the toys these days require assembly, which normally means you at least need a screwdriver and a few fiddly parts. As patience is not a known quality of a toddler, it makes much more sense to wrap them already assembled WITH batteries (see point #4). 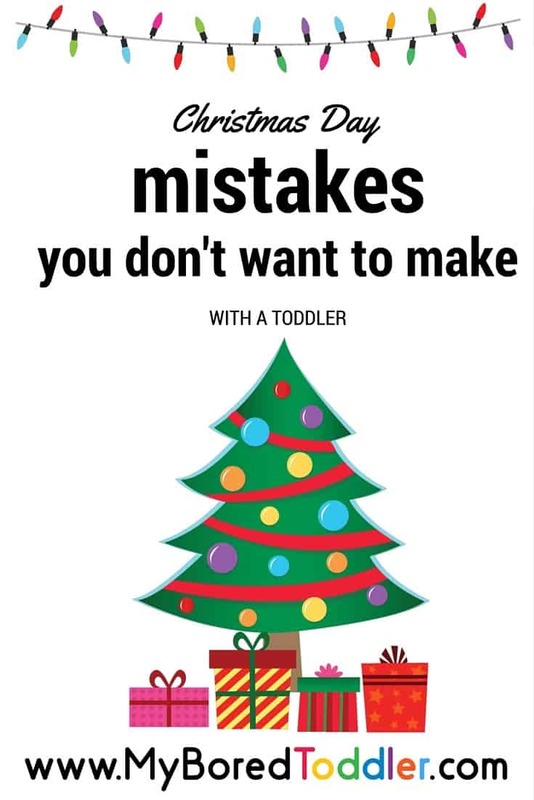 Have you made any Christmas Day mistakes? Let us know in the comments below. Have you seen all of our great Christmas activities? You might like our Toddler Christmas Decorations and Toddler made plant pots, or visit our huge round up of Toddler Christmas activities. Thanks Fiona! Your site looks great – I can’t wait to check it out properly when the kids are asleep!